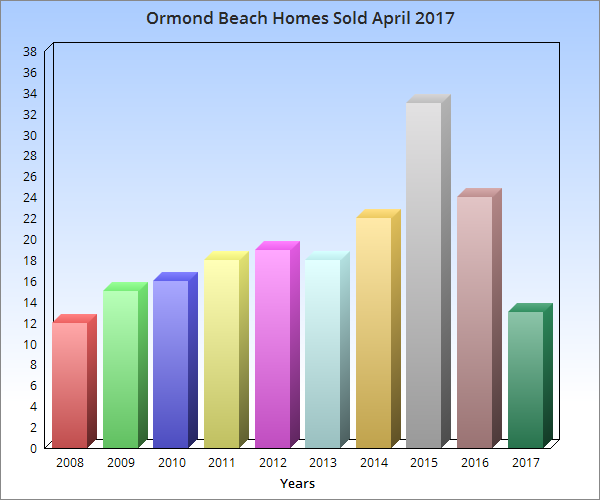 Through the Daytona Beach Area Association of Realtors® Multiple Listing Service (MLS) there were 13 Ormond By The Sea Florida homes sold in April 2017, none of the sales had lender involvement, either a short sale or foreclosure. Additionally, there are 5 homes under contract waiting closing and none of those have lender involvement. The highest priced home sold was a 4 bedroom on Wisteria Dr. for $240,000 and the lowest priced was a 2 bedroom on Seaside Drive for $155,000. For information about Ormond Beach and Ormond By The Sea Florida homes and condos for sale and for rent call 386-441-8245 or visit the Ocean view Realty Group website at www.ovrealty.com where you can also search the Daytona Beach Area Multiple Listing Service (MLS) anonymously. 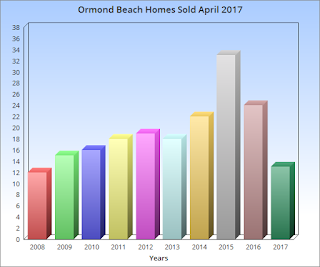 Here is a chart showing Ormond By The Sea Florida homes sold in April 2017 comparing previous years for this month.